We offer 50 foot bucket trucks for commercial and residential eletrical needs. We maintain existing lighting, design and install new lighting, and upgrade our customers to energy-efficient LED lighting. In addition, determining what the lighting needs are for your project and recommending solutions that will provide the best lighting and enhanced security for your location is our goal. 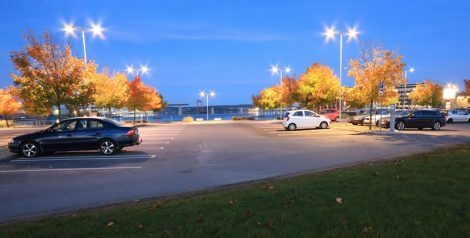 You will benefit from a well-lit parking lot because you will have a safer, more accessible and welcoming entrance for your business. Tenants and customers will feel more comfortable as they arrive and depart the premises. Our fleet of bucket trucks, that reach up to 50′, and our experienced commercial electricians are here to assist you. Prompt electrical service to replace bulbs and repair fixtures is our pleasure. Save money and provide better lighting with our LED fixture conversion service. No job is too small or large for us to handle. Also, try our maintenance plans to make sure your lights never fail. Contact us for a free estimate to get started on your project today.